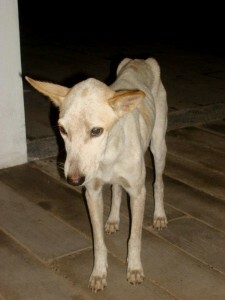 The dog did not have a name when Nicky Wicks spotted her in Sri Lanka. She called her Hope because “there were so many street dogs but I looked at Hope and my heart broke,” she wrote in an email to share this amazing story. A native of Australia, Nicky has grown up with animals from an early age. She attributes her love of animals to her parents, who were true animal lovers. The family always had a house full of rescued cats, dogs, rabbits, and also a horse. Her earliest memories are of rescuing two stray cats with her mother. They spent a lot of time feeding and bonding with them, and eventually the cats came to live with the family. They both lived to the old age of 17 years and had a very happy life. But it was not until about 15 years ago that Nicky realized the heartbreaking reality of the large number of healthy dogs and cats being killed in the pounds every year. She did not look away. She decided to do her part in trying to make a difference. That was a starting point for her, and she became involved in animal rescue as a volunteer at a local shelter in Sidney, Australia. A year ago, Nicky and her husband, Dinesh, moved from Sydney to Los Angeles, and four months later, she started volunteering with Forte Animal Rescue. When she and Dinesh were on a vacation, she sent an email to her peers at the rescue group, “Just wanted to send you my happily-ever-after story from Sri Lanka. Nicky was aware that she was there only for a short time, and worried about what would happen to Hope after they left. Feeding her some steaks was not going to save her. The poor dog needed veterinary care. Nicky and Dinesh had become friends with the manager of the restaurant where they dined with Hope. While the waiters wanted the dog to leave, the manager, Wasantha allowed Hope to stay and let the couple order steaks for her. She knew that if they did nothing, the dog had no hope, but if they did something, she at least had some hope — That was when Nicky named her Hope. They were leaving the next day and had little time. There was no animal adoption system in Sri Lanka, so they spoke to Wasantha and gave him $300 USD to take Hope and her puppies to a veterinarian and care for them. Nicky wrote down which treatments she wanted the veterinarian to give them. Nicky and Dinesh exchanged numbers with Wasantha, and they spoke everyday after they left. Wasantha took Hope and her puppies home. 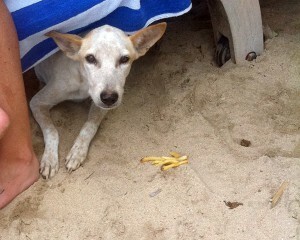 Sadly Hope’s puppies did not survive, but Wasantha and his Buddhist family were able to nurse Hope back to health. 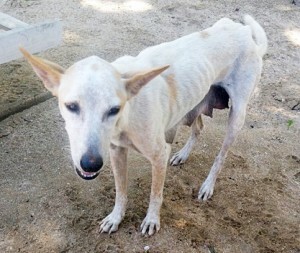 While so many people in Los Angeles are dumping their own family dogs in the pounds and streets, Nicky, not only saved Hope’s life while on vacation, but placed her in her permanent home, and she has followed up on this dog in Sri Lanka for two years, from Sidney, and from Los Angeles. Wasantha, his wife, her parents, and their young daughter live in a beautiful area of the island, and that’s where Hope lives happily ever after.